Les Cimes des Arbres is just a stones throw away from the beautiful river Dronne, where there are many opportunities to take a canoe along the peaceful waterways. Preserved by various environmental protection measures, the river and its banks are home to a remarkably rich range of fauna and flora. In the crystal clear waters, trout, pike and roach can be seen swimming between multicolored pebbles and the pretty white flowering water crowsfoot hosts myriads of luminescent dragon and damselflies, while gray herons and kingfishers are often seen along the banks. Almost all stretches of the river are covered by one or more canoe hire companies, and the price of hire includes driving or collecting you from up or down the river in a mini-bus - so you always end up back at your car! Starting from the west at Brantôme, a beautiful town built on an island and known as the 'green Venice of the Périgord', it is possible to circumnavigate the town, braving the weirs in both directions. It only takes an hour or so but is a hugely amusing experience, especially if you get stuck on the weir where waiting tourists take photographs of your plight! There are two canoe bases (8 & 9, see below) and it is possible to travel all the way down the river to Bordeilles, a journey of around 12km which will take around 3hrs 30mins and cost around €30 for two people. 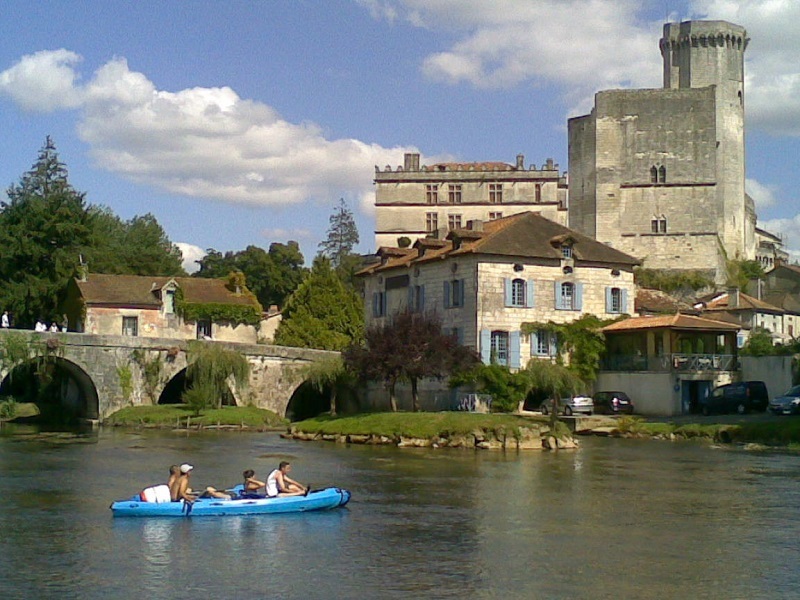 At picturesque Bourdeilles, dominated by its huge castle perched on a spur, there is another canoe hire base (7) just by the bridge as you head out of the town. 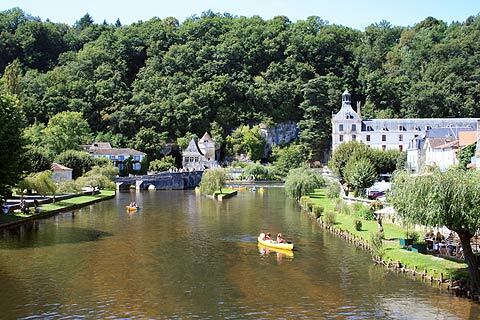 The Dronne then runs alongside some dramatic limestone cliffs towards Lisle, where there is canoe hire (6) at the 'Guinguette' de Renamont (open air summer restaurant) near to Grand Brassac. 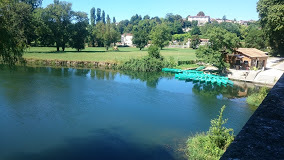 After Montagrier, the Dronne enters a landscape of water meadows to continue its way towards Tocane, where there is canoe hire (5) based at the municipal campsite. Here, a 45 minute excursion will cost as little as €10 for two people, or more intrepid paddlers can attempt the two day trip from Bordeilles all the way to Riberac for around €40. After Tocane, the Dronne meanders on to Saint-Meard-de-Dronne and its riverside 'Moulin de la Pauze', to the larger town of Ribérac, where you will find a further canoe base (4) on the outskirts of the town at the entrance of the Camping Municipal de la Dronne. Routes start from just 4km up to a day long trip which includes a picnic on the riverbank and a tour of the Moulin de la Pauze. Leaving Riberac, the Dronne flows through pretty Epeluche, past St Severin and the 'Halte Nautique' at La Brousse (1) then on to Aubeterre-sur-Dronne, one of the 'Most Beautiful Villages of France'. By the bridge at the bottom of hilltop Aubeterre, there is the Club Canoë Kayak (2) right next to the lovely river beach, which is the closest canoe hire to the gite being just a 5 minute drive away. You can travel from upriver Riberac as far downriver as St Aulaye, with prices starting from as little as €7 per person for one hour - and in July and August you can even go night canoeing! Following the Charente/Dordogne border, the Dronne continues on to Saint-Aulaye with its medieval bridge and pleasant river beach. The Arbor Adventure Parc there has canoe hire (3) covering the river between Petit Bersac and La Roche Chalais. If you have your own canoe with you, the 'Halte Nautique' is less than 1km from the gite. Here, you'll find parking and a lovely shaded picnic area, plus a safe place to launch into the river. Accompanied or free tours: 5, 10, 15, 50 km. May, June and September : daily from 10am to 6pm, closed on Mondays. July and August : Open 7 days a week from 10am to 7 pm. Open July-August every day 11am-7pm; May, June, September by reservation.